A few weeks ago, we wrote an article about “Writing To Reach You Target Audience“. In this article, we wrote about 5 tips that you should follow to increase the traffic on your webpage. This new article is about two tips that we discussed in this article, ‘know your audience’ and ‘think like your audience’, the basics of knowing your target audience. 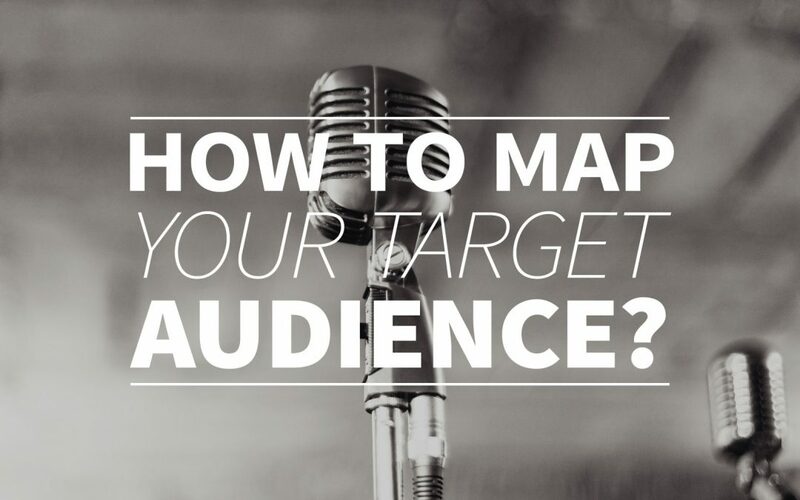 Of course it’s easy to say, know your audience and think like them, but how do you map your target audience properly? That’s what we’re going to do today, based on a two of our own favorite techniques. 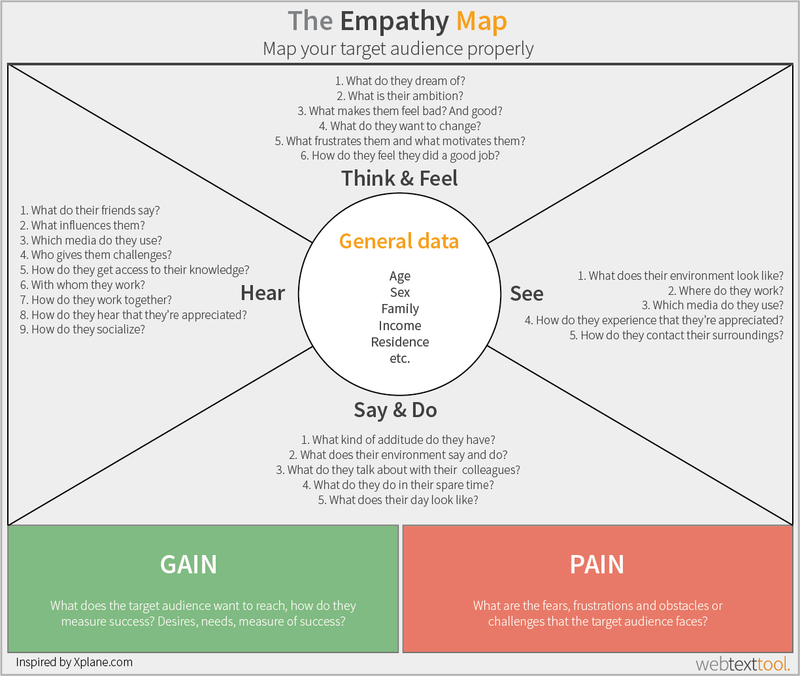 The Empathy Map shows you how to map your target audiences behavior and how to influence their way of thinking. This map treats 6 different aspects of your target audience. What they hear, think & feel, see, say & do but also their pain and gain. Each of these areas helps you to look from a different perspective to make you truly understand your target audience. For example, if you read a question like ‘What influences them?’ in the ‘hear’-section. you have to think from the hear perspective. Like rappers singing or DJ’s talking on the radio. For every target audience, your answer will be different and that’s exactly what makes this technique so handy. This is the best way to get insights that you wouldn’t think of in the first place. You can always think of more questions that fit the things that you want to know and answer them in the different sections! The other technique that we truly recommend is making a persona out of your target audience. If you want to know how to think like your target audience, you can use this technique. All of the details that you know about your target audience, you can humanize into one of these persona’s. You’ll create a lifestyle, gender, age etc. If you’ve created a complete personage, you’ll be able to test all of your ideas and content to this person. You can choose to search for some real people that fit your personage and ask for their opinion or you can fit your ideas to what you think that your target audience likes! But there are a few things that we have to warn you about. It’s possible that your personage doesn’t fully cover your whole target audience. In this case it’s very important to segment your target audience properly. Every segment gets it’s own persona, to make sure that you can test your content to all of them. The other important thing is that you won’t stereotype your target audience too much. Of course, you’ve got to have some stereotypes but make sure that you won’t think that every person that twitters, likes to gossip or every wikipedia reader is a nerd. If you pin yourself too much to these stereotypes, there will be a change that you ban a big part of your audience and that’s something you want to prevent. One thing to keep in mind is that educational level is an important aspect of a persona, especially when creating content – to make sure that your content fits that level and has the right readability level, it should not be too complex or too easy to read. Having your content at the right quality level, will increase conversion! We can truly recommend to use these techniques and if you want to get the most complete image of your target audience, you can also use them both at the same time. These two techniques and also the technical optimization with webtexttool are easy to combine, great isn’t it?